As a young professional, I find myself wanting to create trendy, eye-catching outfits while remaining within the realm of respectable business casual clothing. Adding basic work pieces to my wardrobe has given me so many options to choose from every day, and I love creating several outfits from a few simple pieces. Not to mention it saves some major moola when you can mix and match. And sis, professional dress doesn’t have to be boring. There are so many fun items you can add to your wardrobe that you can adapt for work or play. Here are a few affordable staples you need to go from the boardroom to the bar. You can add a blazer to just about anything and be ready to discuss strategy with your boss or meet friends for happy hour after work. 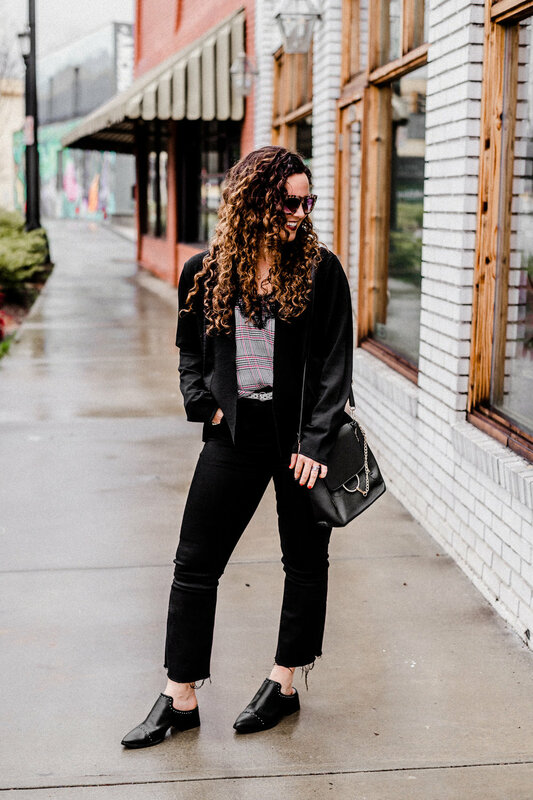 A good black blazer will endure the test of time and is sure to give you a polished and profesh look at your 9-5. This one comes in several colors. Here are a few options if you want to step outside the box a little! Button-ups can be chic and feminine when you pair them with the right accessories! You’ll get the most wear out of a white, blush or cream blouse but don’t be afraid to push the limits with an interesting plaid, subtle animal print or simple floral. This one is a great modern take on a button-up from a local Greenville boutique. You need a good pair of plain black pants, no questions asked. I love the Pixie Pants from Old Navy because the price is right, and they come in every color under the sun. I know my size and I can walk in, grab a new color and be out the door in 10 minutes. Any straight leg neutral pant is going to go a long way in your work wardrobe. Whether you decided to wear them with flats or heels, I promise you’ll be reaching for them day after day. I am not on my feet a lot at work, seeing as most of my job is done on a computer, but I still value a pair of shoes that I can feel confident, comfortable and cute in. Lately I have been loving a pair of mules that I scored at Greenville Bargain Hunt for $5! They are so easy to slip on when you’re in a rush for work and they can be adapted for just about any season. The heel adds a little height, which this 5’2” girl needs, but it also makes them appear dressier, which is nice for a day when you have a presentation or a meeting with clients. Find yourself a good work shoe and never let her go! If you don’t have a Bargain Hunt near you, these mules are on clearance for only $21! I live and breathe for my favorite work tote. It holds my laptop, planner, water bottle, small makeup bag and binders for client meetings. I carry this bag all week and then switch to a smaller one on the weekend. If you don’t have a catch-all bag that looks classy and clean for work, it is time you invest in one! Nothing says “I mean business” like a good tote! This one is what I carry everyday. I hope these simple tips help you land the job, nail the pitch or just feel excited to go to work in the morning. Here are my exact outfit details: Black Jeans | Tank | Blazer | Mules | Bag.